You can work out from the slightly dodgy translation, that there are now 2 of these real life DAF XT’s. 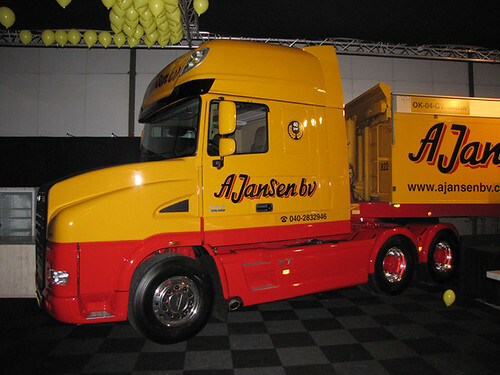 The trucks have been produced to celebrate Jansen BV’s 40th Anniversary, just imagine what could happen when they reach the big 50!! Keep your eye’s peeled on the press, as I say i’m sure it will be making a lot or appearances. What’s your first impression? Is it like mine; The grill is too chunky, then email me; ben@truckblog.co.uk or you can leave a comment, or these day’s you can even get me on Twitter, @truckbloguk amazing stuff! Not sure who’s photo’s these are but if you let me know I can credit you. I would also like to say a big thank you to Graham Wilson for informing me of the DAF’s existence. 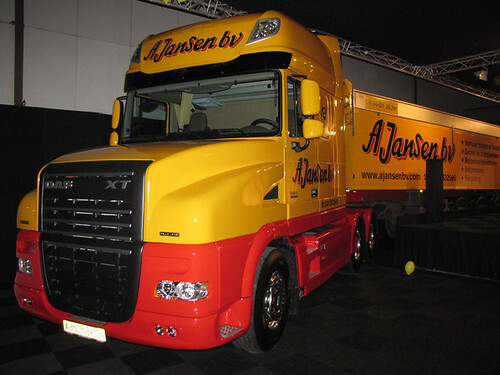 This entry was posted in DAF, NEWS, Photos by truckbloguk. Bookmark the permalink. I can’t believe I didn’t get a mention for finding this!